All Network Protocol are categorized by conception of Layers. Layers are mainly used by OSI Reference Model and IP Set Model. TCP/IP , which is defacto standard in internet , is based on IP Set Model, but the words "Layer" is indicated that it is based on OSI Reference Model. The current mainstream TCP/IP is based on the IP Set Model, but the word "Layer" conventionally refers to the layer based on the OSI Reference Model. In this way, it is practical that it is an IP Set Model, but the layer that comes up in the conversation often points to the one of the OSI Reference Model. For example, Layer 2 switch, Layer 3 switch, Layer 4 switch, Layer 7 switch indicate layers of the OSI Reference Model, and obstacles resulting from not being physically connected are called "Layer 1 obstacles". lThe OSI(Open systems interconnection) Reference Model is a hierarchical model created by ISO and CCITT. However, the current mainstream Communication Technology TCP/IP does not strictly follow this model. That is, data communication currently strictly based on this hierarchical model is a minority. TCP/IP uses a hierarchical model called "IP Set Model" because of ease of implementation. A comparison between the OSI reference model and the IP set model is shown in the table below. The roles of each layer are as follows. Physical requirements such as cable type and connector shape, and noise reference value for transmission of bit in transmission medium (electricity or light) are defined. Specific implementations include UTP category 5e / 6 / 6a, optical cable of single-mode and multi-mode, coaxial cable etc. Define how to communicate directly or between devices connected via Layer 2 equipment (L2 switch etc.). It specifies how to make concrete bit strings and so on. The communication destination at this layer is not limited to the device you want to communicate with, but it may be a data transfer device such as a router or L3 switch. Ethernet is the most popular implementation, but there are other PPP , PPPoE, ATM, frame relay, etc. The Network Layer should not change to the destination, but the Data Link Layer can be changed in any number of times without any problem. Rather, the role of the Data Link Layer is to absorb physical changes such as cables. Though the Data Link Layer can be used depending on the Physical Layer, for example, OM3 type of optical multi-mode corresponds widely from 100 Mbps to 100 Gbps. IP is the de facto standard for implementation. TCP/UDP is the de facto standard for implementation. Whether to use TCP or UDP is chosen depending on the protocol of the Application Layer, but in some case, for example NTP or syslog, etc, RFC it is said that "should be used with UDP", software which can be set by TCP Yes. A concrete implementation is TLS (former SSL). The famous implementation is ASCII mode of FTP. 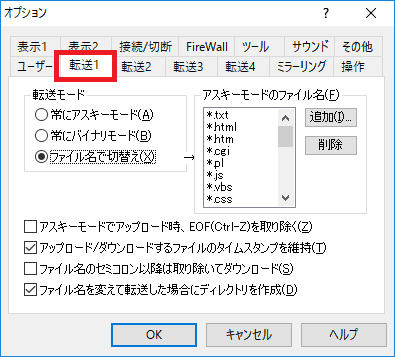 For example html files created on Windows will be [character code Shift-JIS] and [line code CR + LF], but if you upload this to Linux under FTP as ASCII mode, you can see [character code EUC-JP] and [ Code LF] automatically. If you do not want this conversion, use binary mode. 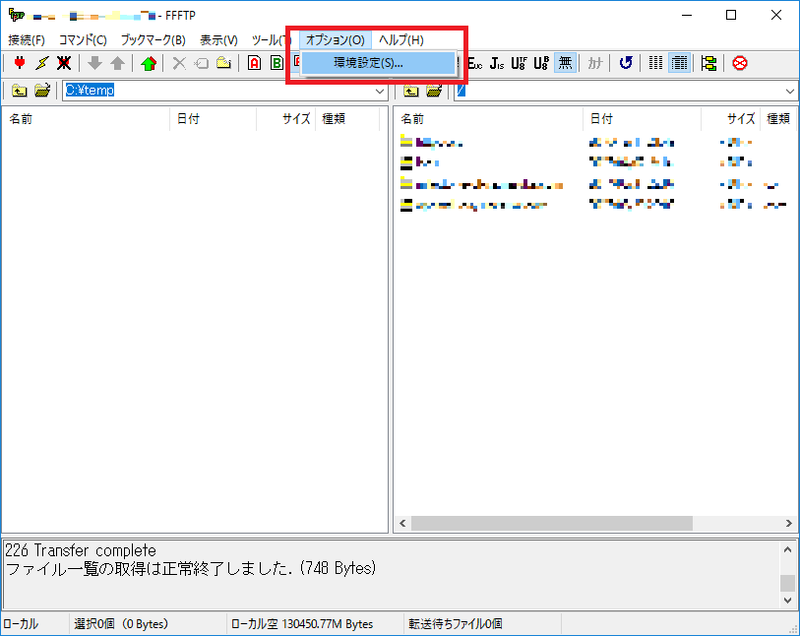 For example, you can set as follows for the famous FTP client software "FFFTP". By clicking "Preferences" in "Options" and clicking "Transfer 1", you can select "transfer mode always" ASCII mode "always" binary mode "" switch by file name ". By default, "Switch by file name" is selected. For example, when you want to download html files etc on web server, it is job of this layer to use GET command.